Tears Of A Clown, the cabaret show Madonna performed last night at the Forum theatre in Melbourne, was the complete antithesis of a Madonna concert. Usually, every second of her live performances is meticulously choreographed, resulting in theatrical events with plenty of spectacle but little spontaneity. 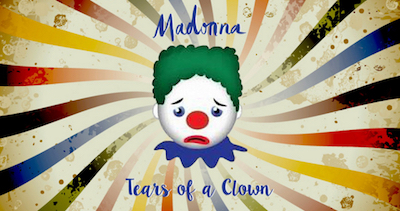 In contrast, Tears Of A Clown had no dance routines, costume changes, or choreography, and Madonna described it as "this work in progress, this rough rehearsal". The show was an incongruous combination of corny jokes and melancholy. One song, Intervention, was dedicated to her son, over whom she's currently fighting a custody battle: "Everybody knows the saga of me and my son Rocco. It's not a fun story to tell or think about." Introspective moments like this felt awkward, with the crowd regularly shouting reassurance, and the concert was intimate though fairly shambolic. Madonna seemed relaxed during the show, drinking cocktails between songs (most of which were ballads). She performed two cover versions (Send In The Clowns and Between The Bars), and the only song from the current Rebel Heart Tour was her traditional encore, Holiday. The full set list was: Send In The Clowns, Drowned World/Substitute For Love, X-Static Process, Between The Bars, Nobody's Perfect, Easy Ride, Intervention, I'm So Stupid, Paradise (Not For Me), Joan Of Arc, Don't Tell me, Mer Girl, Borderline, Take A Bow, and Holiday.